I have a monthly flower budget. It sounds extravagant doesn't it? My budget is...............ten bucks! Yep I allow myself ten dollars to spend on having fresh flowers in my home. Now if you are saying that even $10 is not in your monthly budget, I have been there too. When money was so tight that even ten dollars was indeed extravagant! My grocery has a great selection of flowers, bouquets start around $3.99 and go up from there, but I have found them in the discount bin for $2.50 and they still look great. I try to choose varieties that are long lasting and can usually get almost two weeks from them. This bunch was in the discount bin for half price and they were still fresh. 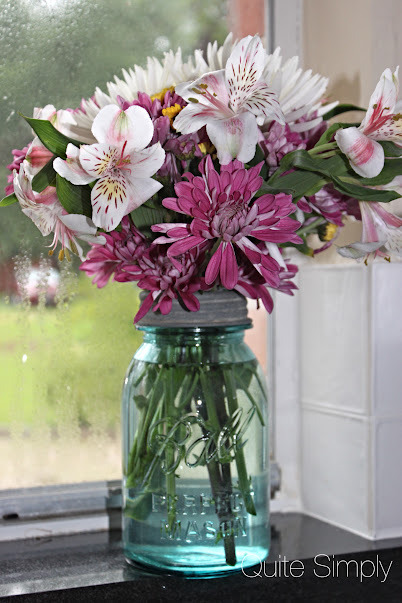 Usually the bouquet will contain a packet of powder to put in your water, if not you can also add just a bit of sugar, this will extend the life of the flower. I then cut the flowers with kitchen shears to the proper height for the container I am using. I have about four different vases and I also like to use jars and pitchers. Although I occasionally will use them in the breakfast area or the bathroom, my favorite place is on the ledge just above my sink. 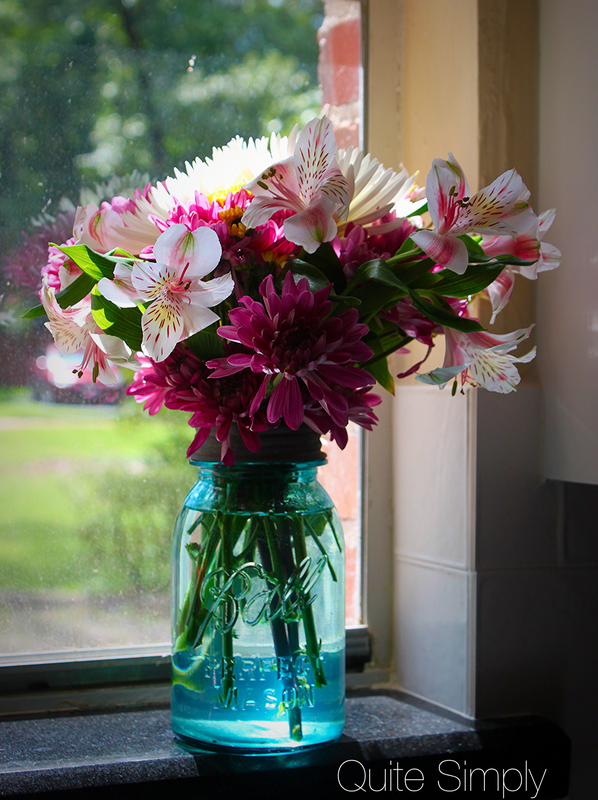 If you are like me you spend a lot of time in the kitchen and I must admit that hand washing dishes is not a favorite task of mine, the flowers just make this chore a little more pleasant. 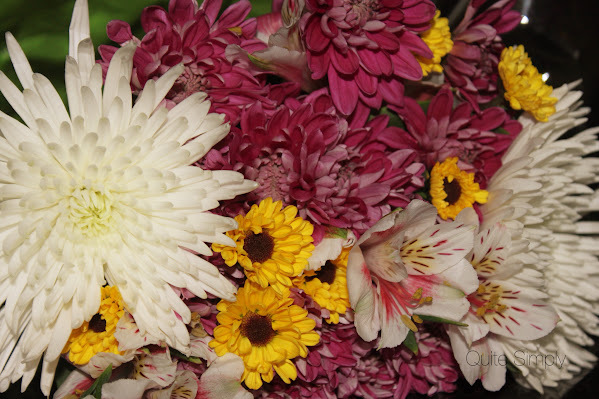 I am hoping to add more cutting flowers in my flower garden next year and have a few bouquets I grow! Do you enjoy fresh flowers in your home, do you ever treat yourself to a bouquet? My sweet husband picks me fresh wildflowers all the time. Yesterday he destemed several sunflowers and lined them along the back of the lavatory! Such a pretty surprise. I have bouquets in the kitchen and the dining room that he picked for me. I love fresh flowers! Barbara, you are one lucky lady! I really want to grow a good enough garden that I can pick my own flowers, but we have moved 5 times in 4 years. 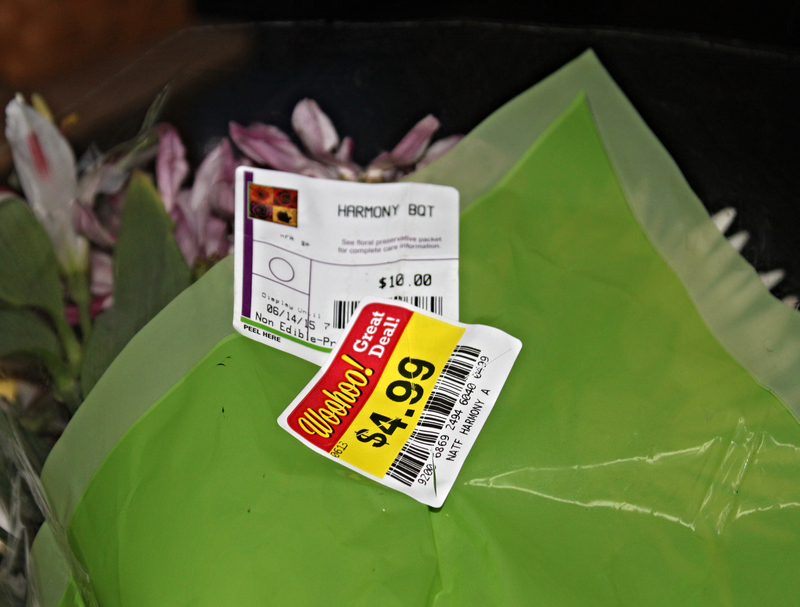 Flowers in our discount bin start at $5 and are normally $20. Though I did enjoy buying them when my kitchen was big enough, though in a caravan currently. You need a bud vase and a single flower! I hope you get your garden and I am hoping to get one myself! Thanks for dropping in! I think it’s nice that you have a flower budget, especially if they help brighten up your home even more. It wouldn’t hurt to spend a few bucks for aesthetics, especially if they tend to last for a few days. Anyway, thanks for sharing this with us, Susan. Have a great day! My wife loves fresh flowers in our home, (and I do too) but honestly, I didn't think we could afford to have a flower budget. So when we revamped our budget, the flowers were the first thing to go. Like you said, it sounded "extravagant," but ten bucks is doable. On behalf of my wife, thanks!